Ready made Non OS, Windows PCs of all shapes, sizes and prices designed to meet your computing needs whatever they may be. There are mini-PCs which can be taken practically anywhere, space-saving all-in-ones where everything is built into the monitor, and regular desktop systems configured to meet a range of needs from home office to pro gaming. 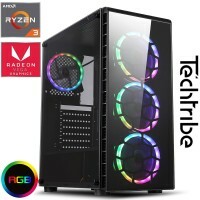 This category is also home to our exclusive Techtribe desktop systems, all of which are designed, assembled and tested by our expert engineers.